The government is providing additional funding of £150 million per annum for academic years 2013 to 2014, 2014 to 2015 and 2015-2016 to improve the provision of physical education (PE) and sport in primary schools. This funding – provided jointly by the Departments for Education, Health and Culture, Media and Sport – will be allocated to primary school headteachers. This funding is ring-fenced and therefore can only be spent on provision of PE and sport in schools. Eligible schools Funding for schools will be calculated by reference to the number of primary-aged pupils (between the ages of 5 and 11), as recorded in the annual schools census in January. Schools must spend the additional funding on improving their provision of PE and sport, but they will have the freedom to choose how they do this. Our school will receive £8,000 plus a premium of £5 per child each year. The money can only be spent on sport and PE provision in schools. The money will be used so that all children benefit regardless of their sporting ability. At St James’ CE Primary School we are passionate about sports and recognise the importance that physical activity has on children’s lives. We believe that a well organised and engaging sports curriculum helps children develop confidence and a sense of achievement, it teaches young children how to rise to a challenge, and nurtures the character and skills that will help them get on and succeed in life. We aim to provide a positive and engaging experience in physical education at our school. The School Sport Premium will ensure that children are physically active and excited about ‘Sport’ at our School. As well as increasing fitness we hope that children will appreciate team work and a healthy lifestyle. 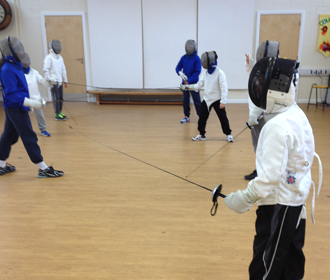 This funding provides the foundations which will allow children to develop a sporting habit for life! Up-skill Teachers and Learning Support Assistants to improve the quality of sport lessons. Increase the amount of competitive sports that our children participate in. Encourage children to improve their leadership skills through sport. Introduce new and unusual sports as diverse as fencing, summer sports, cheerleading, dancing with props and encourage more children to participate. Boost Change 4 life clubs, helping children help build a healthier lifestyle. Give extra support to those children who are talented and also those children who have Special Educational Needs.